One year after Dieter Ortmann, CEO and founder of the German maxx-solar & energie, started planning the project, the first pilot system was commissioned. Another half a year later, students now benefit from the system and maxx-solar energy and GreenFin have launched a financing tool to make PV renting available to the masses. PV renting is a great concept to purchase photovoltaic systems without a big initial investment. Practical implementation has been extremely successful in South Africa. Here is a summary of the achievements of the last one and a half years and a review of the positive impacts of the project. The first milestone was achieved in March this year, when the first 20kWp pilot project was installed and commissioned at the Dominican Grimley School in Hout Bay. During the inauguration ceremony in April, the PV renting approach was presented to a wide audience. On 10 November 2016, the greenfin-maxx PV renting financing tool was launched. The greenfin-maxx PV renting tool enables home owners and enterprises to benefit from cheap solar electricity without any investment costs and to save money every month, as PV electricity is cheaper than the electricity from the grid. 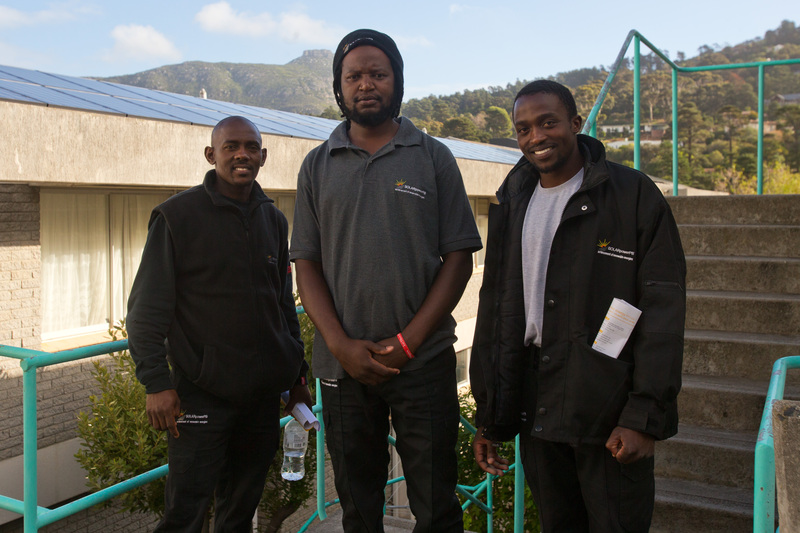 Thanks to the dena Renewable Energy Solutions Programme, maxx-solar energy PTY Ltd. was able to install a PV renting pilot project at the Grimley School in Hout Bay. The maxx I solar energy PTY Ltd. is convinced that education is the only way to promote a sustainable use of solar power in our country. Thus, we run the training academy maxx I solar academy for installers and engineers, but we also target the public. “Installing our first PV renting project at a school is especially interesting for us, as this gives us the chance to show the children what solar energy is and how they can benefit from it”, says Antje Klauss-Vorreiter, head of the maxx I solar academy. To increase awareness among the students, Vivian Bluemel from the maxx I solar academy organized an energy day in cooperation with the science teachers at the school on 13 October. Twenty students with hearing impairments from grade seven to nine used mini-solar cells from the maxx I solar academy experimental kits to find out how photovoltaic energy production works. In three groups, the children connected the small cells just like real PV systems are connected and had a lot of fun testing out different lighting conditions and their influence on power production. All students showed great interest in the technology and were very excited to learn more about the solar power system of the schools. Vivian explained students the components and functionality of the 20 kWp solar power system of the school. The students asked many questions and even wanted to know how their school could finance such a big investment. Vivian explained them that the school leases the system just as their parents lease a car. The whole group understood that using the PV renting concept saves the school money. Photo 01: Grimley School students proudly running a small motor with solar energy. Photo 02: The students and Vivian from maxx-solar academy in front of the school’s PV renting system. For the last 4 years in South Africa (and last 16 years in Germany), maxx I solar energy has been gathering a #RooftopRevolutionaryArmy. A network of highly trained installers across Africa that rally behind a cause. A cause that is bigger than any individual or company and a cause that is gathering greater momentum everyday. 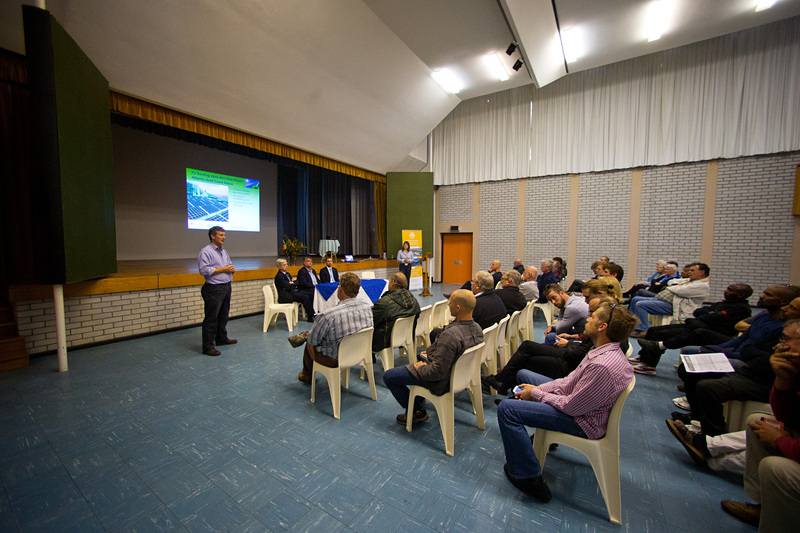 We have trained more than 1000 attendees through our academy and are one of the few South African companies to complete projects or be involved in solar energy across most of the SADC countries. The call to action and response has been enormous. 1 - It makes (financial) sense! In the projects we are involved, system owners make a huge saving per unit of energy they require. With energy costs from the grid being around R1.50 to R2 per unit - energy from solar panels can be almost 150% cheaper than the grid! 2 - It is the energy source of the future - available now. If you could go back in time and buy shares in cellphone companies would you do it? if you knew a few years ago how big mobile connectivity would get what would you have done differently? This is the case with energy from solar panels - it is the energy source of the future and thus the longer the wait to make a decision, the more there is to lose. 3 - Thirdly, the final thrust of our revolution - the drive and motivation to "Be More Independent" - after our flag ship solution, the maxx solar BMI system. Who does not want to secure energy security in such volatile times and prices. These three factors are the reason to get behind the solar energy revolution. Cheaper energy, future proofing energy security. Take a look at what is possible with a small home system from maxx, always installed by trained professionals. 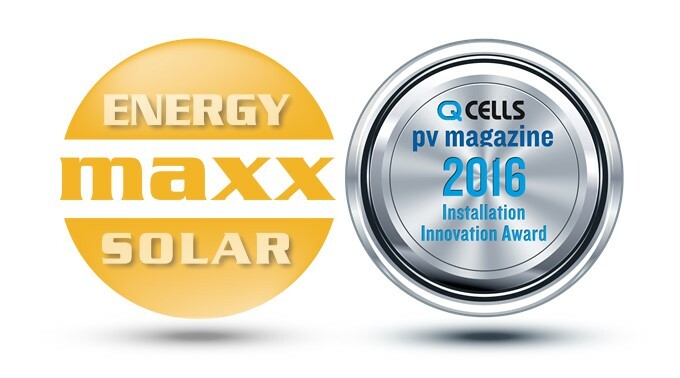 After three weeks of intense voting, pv magazine and Hanwha Q CELLS declared Maxx-Solar Energy, a South African company with German roots, as the winner of the Installation Innovation Award for its project delivering innovative financing solutions for solar photovoltaic in Africa. A total of 20 companies submitted their entries for the Installation Innovation Award, from which the four finalists were handpicked by pv magazine. Their project concepts were presented at the recent Intersolar Europe exhibition in Munich, after which online viewers could vote for their favorite pitch. With more than 800 votes cast, the winner became apparent on Monday, July 8, with Maxx-Solar Energy claiming top spot. In 2011, Dieter Ortmann, built a bridge from Germany to South Africa and founded a branch office of the German company maxx-solar & energie in South Africa there. "With the goal of bringing training through the newly-founded Solar Academy and becoming a supplier to the installers we train there and to provide our customers with all services related to photovoltaics," says Ortmann, the founder and Managing Director of the maxx I solar Energy Group, which also enlisted the help of the German Solar Energy Society (DGS) for the trainings. Now Ortmann is involved in a project he is so proud of that he threw his hat into the ring for the Innovation Installation Award sponsored by Hanwha Q Cells and pv magazine. Ortmann arranged financing for a PV plant for the Dominican Grimley School in Hout Bay, a school for the deaf attended by around 100 children. Ortmann thinks of the undertaking as an exemplary project that can act as a model for further PV installations. Indeed, although many people are convinced of the benefits of solar energy, the upfront invest often proves difficult to stem. The lack of financing options is one of the main obstacles to the implementation of small-scale photovoltaic systems in South Africa. PV renting is an innovative financing option which allows everybody to benefit from cheap, green solar power. Thanks to the maxx I installers RED Engineering PTY Ltd. and SOLARpowerPB PTY Ltd, the two pilot projects, Dominican Grimley School and the Atlantic Gold Guest House in Camps Bay could be identified. RED Engineering and SOLARPowerPB are two of the 40 maxx I team installer companies based in the Western Cape. Patrick Baldamus, CEO of SOLARPowerPB PTY Ltd., had already installed a heat pump in the Dominican Grimley School for deaf children in Hout Bay. The school had been looking for alternative energy sources for a long time but could not afford to invest in installations. “I always tried to find an opportunity to support the Grimley School in getting a PV system; once I heard about the maxx PV renting approach, I knew that this would be a great solution for them” said Patrick Baldamus. He put maxx solar and the school in contact and installed the system at the beginning of the year. Ortmann and his team link up potential operators with investors and develop a good solution for both. The Grimley School is now renting a PV system. The conditions are right. The location gets approximately twice as much solar radiation as Germany, for example, which makes the power half as expensive. Amortization for off-grid systems therefore follows a similar track. Added to that is the aspect of self-sufficiency, he says, as power supply is not as reliable as in Europe. The rental model works much like similar schemes in Germany. The owners are a tax adviser and a South African owner, both locally based. The first thing to be done is to show how this can work. After the agreed rental period (twelve years in this case), the school will be able to purchase the system at a low price of around €100/kW. This price point, however, is often a sticking point. The rental fee cannot be too high, and the purchase price at the end of the rental phase has to be reasonable so that the tenant benefits from of the system. This is the case in the Dominican Grimley School project. The monthly rent is approximately €2,700. At a 70% self-consumption rate, this is already below the cost the school would have paid for the electricity. But the system design is likely to generate a self-consumption rate closer to 100%. That means that, even in the rental phase, the school will see significant savings month after month – using 90% of the power it produces should save the school some €800 a year according to the figures provided by Maxx-Solar. It is a 20 kW system producing 33,000 kWh; the school needs 144,000 kWh. "In ten years the system will have paid for itself," says Ortmann. The only thing lacking is an emergency power supply which financing options are currently being explored. Maxx I solar energy together with the maxx I team installer companies already could identify financing partners for more PV renting projects. PV renting financing left the pilot stage and is thus now accessible to the general public. More information about the project, the PV renting approach and maxx-solar energy on www.maxx-energy.co.za. Read the original article on http://www.pv-magazine.com. Do you want to know the whole story? WE WON! We have never been more proud: The 2016 Installation Innovation Award went to South Africa! After three weeks of intense voting, pv magazine and Hanwha Q CELLS declared us to the winner of this internationally recognized award. At the recent Intersolar Europe exhibition in Munich the 4 final projects out of 20 were presented and with your help we managed to get over 800 votes! You can read the complete article by PV magazine on www.pv-magazine.com. Do you know what project we actually won with? It is our PV renting project at Grimley School in Hout Bay. We installed a PV system but the school doesn't have to pay the whole system price at once but in monthly instalments -just as if they were renting a car! We prepared a data sheet that sums up all important information (see on the left) and also a brochure that explains the PV renting concept in general. But why are we insisting on sharing our success with you (beside the obvious reasons)? Actually three maxx-team installers helped us A LOT with this project: Patrick from SolarpowerPB, Clemens from RED Engineering and Peter from HH Roofing. Thank you guys for shooting us to the top! If you want to be the next one to win awards with us;) contact us to share ideas for a great collaboration. We are a strong believer that strength is built in numbers and with you on our side this is easily possible. Many of you already have the maxx-alumni on their websites, why don't you add the award logo as well to obtain extra interest and leads? Bulawayo – South Africa is the only African country ranked by the International Renewable Energy Agency (IRENA) as providing cheap solar energy to consumers as an alternative to other forms of energy and is currently sitting on number five globally. South Africa is home to the largest solar farm in the Southern Hemisphere, Africa and the Middle-East region constructed in 28 months. The 175 megawatt facility with the capacity to power 75 000 households, is located in the mostly arid land of De Aar in Northern Cape and spans across 473 hectares. Statistics released by IRENA show that the rainbow nation is selling solar energy to consumers at US$0.075 per kilowatt-hour (kWh). The United Arab Emirates is the cheapest in the world (US$0.030) followed by Mexico (US$0.045), Peru (US$0.048), Chile(US$0.065), Jordan (US$0.067), Germany (US$0.080), France (US$0.089) and the United Kingdom (US$0.093) is rated the most expensive in terms of solar energy. The Zimbabwe Power Company, in partnership with Intratrek Zimbabwe, is working to establish the country’s inaugural 100 megawatt solar power station in Gwanda, Matabeleland South province, as government intensifies efforts to harness one of the cheapest sources of energy in line with efforts to provide power to all households in country. Apart from these efforts, a sizeable number of the local population has turned to solar energy for lighting using solar lamps or torches and solar photovoltaic (Solar PV), solar phone charging and water heating. According to IRENA solar PV is the most widely owned electricity source in the world in terms of number of installations, and its uptake is accelerating. It accounted for 20 percent of all new power generation capacity in 2015. In the last five years, global installed capacity has grown from 40 (gigawatts) GW to 227 GW. By comparison, the entire generation capacity of Africa is 175 GW. The share of global electricity generated by solar PV could increase from the current 2 percent to as much as 13 percent. IRENA director general Adnan Amin said solar PV capacity could reach between 1 760 and 2 500 GW by 2030, up from 227 GW in 2016. “This comprehensive overview of the solar industry finds that these cost reductions, in combination with other enabling factors, can create a dramatic expansion of solar power globally. The renewable energy transition is well underway, with solar playing a central role,” he said. Solar PV often costs between US$0.5 and US$0.10 per kilowatt-hour (kWh) in South Africa, India, Europe, China, and the United States. Last year, record low prices were set in the United Arab Emirates (5.84 cents/kWh), Peru (4.8 cents/kWh) and Mexico (4.8 cents/kWh). Amin said world electricity demand is expected to grow by more than 50 percent by 2030, mostly in developing and emerging economies “To meet this demand while also realising global development and sustainability goals, governments must implement policies that enable solar to achieve its full potential,” he said. To cope with the expected increase in the use of solar energy, IRENA suggests that government come up with updated policies based on the latest innovations; government support for continued research and development activities; creation of a global standards framework; market structure changes; and the adoption of enabling technologies like smart grids and storage. IRENA is mandated to be the global hub for renewable energy co-operation and information exchange by 148 members (147 states and the European Union). Roughly 28 additional countries are in the accession process and actively engaged. Not all PV plants have similar good conditions for electricity generation. Often it is unavoidable that buildings, antennas or roof dormers cast their shadows onto the module surface. The newly developed OptiTrac Global Peak operation management system by SMA ensures that the inverters - even in partially shaded plants - can almost completely use the energy offered by the PV modules. Every PV inverter has a so-called MPP tracker. It ensures that the PV modules are constantly operated at the point of maximum power (Maximum Power Point, MPP). Simply said, it is about "teasing" the available power completely out of the modules at a certain solar irradiation. In SMA inverters, this job is done by the operation management system OptiTrac - thereby ensuring maximum yields. But if individual modules of a string are shaded, its power curve changes significantly: It now shows several operating points of different quality, which cannot all be found and used by a conventional MPP tracker. In this case, the current output of the PV plant might be considerably lower than it actually should be in terms of shadowing. The SMA solution is called OptiTrac Global Peak: To find and use the optimal operating point of partially shaded PV plants, the proven operation management system OptiTrac has been complemented by an additional feature. It allows the inverter to use the energy offered by the PV modules almost completely - in any circumstance. SolarEdge is offering a variety of trainings in the upcoming weeks and we want to make sure you don't miss out. Below is an updated list of trainings. We hope that you will register and join. The webinar will take place May 24, 2016 at 11:00 AM - 12:30 PM SAST. Learn how to use SolarEdge's module-level, cloud based monitoring so you can improve your PV asset management. Intended for users already familiar with the monitoring platform, the webinar will review reporting capabilities and API services. The webinar will take place May 25, 2016 at 11:00 AM - 12:00 PM SAST. FREE full-day workshop to learn about SolarEdge's products and benefits. The training will introduce you to SolarEdge technology, provide you with the tools and knowledge to sell SolarEdge residential and commercial systems, and teach you how to install, configure, and commission a SolarEdge system. Also included in the training is an explanation of the SolarEdge StorEdge™ solution for PV energy backup, compatible with the Tesla home battery, the Powerwall. The leading solar manufacturer issues SEC filing in which it raises specter of inability to meet its outstanding obligations, which currently stand at more than $1.6bn. With more than $1.6bn in short-term debt and a lack of cash resources, Yingli has warned that it may have to liquidate assets. In a bombshell SEC filing issued after the close of the U.S. markets late on Friday, Yingli Green Energy, the second-largest solar company in the world, has warned that it may be unable to continue as a going concern due to "substantial indebtedness". The 20-F filing was released shortly after the company published its delayed 2014 financial figures, and candidly lays bare the stark situation of Yingli’s financials. "Our substantial indebtedness could adversely affect our business, financial condition and results of operations, as well as our ability to meet our payment obligations under our debt instruments and further grow our business," read the filing. Yingli revealed that it has outstanding short-term borrowings of RMB 10,112.1 million ($1.63 billion) and long-term debts of more than $460 million. This level of debt, the company added, could make it more difficult to meet its payment obligations, resulting in cross-defaults that could trigger restrictions in the company’s ability to secure further financing, thus placing it at risk of liquidation. The filing continued: "If we become unable to continue as a going concern, we may have to liquidate our assets, and the values we receive for our assets in liquidation or dissolution could be significantly lower than the values reflected in our audited consolidated financial statements." Yingli’s lack of cash resources and its potential inability to continue as a going concern will likely then adversely affect the company’s share price and overall value. At the end of April, Yingli was granted a 15-day extension in filing its 2014 annual report, triggering rumors within the industry that the company’s long-term financial health had suffered. Yingli recently agreed a pre-funding payment of approximately $207 million to China Government Securities Depository Trust and Clearing Company Limited – a payment that industry watchers believe was made to allay fears that Yingli was in financial trouble. Since leading the solar industry between 2012 and 2013,Yingli was shunted from top spot last year by Trina Solar, and its recent financials – though solid – have seen the company slip even further behind. In 2014, Yingli shipped a record high 3.3 GW of modules, which increased the company’s gross margin to 17.3%, up from 10.9% in 2013. Efforts to diversify its market presence and reduce manufacturing cost were successful, the company claimed, with gross profit reaching $360.7 million. However, weighed down by debt, the company’s operating loss was actually RMB 215.2 million ($34.7 million) last year, which equated to a negative 1.7% operating margin. And despite being a recognized presence in the leading solar markets, Yingli’s "significant short-term borrowings" are proving a millstone for the company, which added in its filing that it may not be able to renew them when they mature. Der Ausbau der Photovoltaik in Südafrika boomt seit Ende 2015. Großanlagen werden international finanziert und in zentralen Ausschreibungsrunden durch die Regierung vergeben. Es fehlt jedoch an Finanzierungsinstrumenten für Photovoltaik Aufdachanlagen. Wer es sich leisten kann, investiert in eine eigene PV Anlage, um unabhängig von Strompreiserhöhungen und Stromausfällen zu sein. Aber nicht jeder hat die finanziellen Mittel, in eine eigene PV Anlage zu investieren. Es gibt derzeit keine Finanzierungsprogramme für PV Anlagen, auch werden PV Anlagen nicht als Sicherheiten für Kredite anerkannt. Mit dem PV Mieten Ansatz bringt die Firma maxx-solar und energie GmbH & Co KG aus Waltershausen ein innovatives Finanzierungskonzept nach Südafrika, das den Ausbau der Solarenergie beschleunigen wird. Die ersten Pilotprojekte in Kapstadt wurden im Rahmen des dena-RES-Programms realisiert und am 19. Mai eingeweiht. „Es ist nun genau ein Jahr her, dass wir die Idee hatten, den PV Mieten Ansatz nach Südafrika zu transferieren. Dank der Deutschen Energie-Agentur konnten wir letzte Woche die ersten beiden Pilotprojekte einweihen“, sagt Dieter Ortmann, Geschäftsführer der maxx-solar und energie GmbH & Co KG. Bereits im Jahr 2011 hat Dieter Ortmann ein Tochterunternehmen in Südafrika gegründet. Genau wie das deutsche Unternehmen sollte die südafrikanische Tochter Systemanbieter im Bereich Photovoltaik sein. Doch vor 5 Jahren steckte der südafrikanische Solarmarkt noch in den Kinderschuhen. „Wir haben begonnen in der Solarbranche in Südafrika zu arbeiten, als es die eigentlich noch gar nicht gab“, sagt Dieter Ortmann. Um das Land auf den vorauszusehenden Solarboom vorzubereiten und die Firma maxx in Südafrika zu etablieren, begann die Firma mit dem Aufbau der maxx-solar academy, einem Trainingsinstitut für Photovoltaik, in dem mittlerweile über 1500 Leute ausgebildet wurden. Die maxx-solar academy ist der südafrikanische Arm der DGS SolarSchule Thüringen. Die Deutsche Gesellschaft für Sonnenenergie, kurz DGS, steht heute noch für Qualität der Kurse in der academy in Südafrika. Mit ihren Arbeitsfeldern Großhandel und Training ist die Firma maxx-solar & energy PTY Ltd. mittlerweile ein fester Bestandteil des südafrikanischen Solarmarktes. Als IBC Solar Premiumpartner für Südafrika steht die Firma auch im Großhandel für deutsche Qualitätsprodukte. Um die deutsche Qualität auch in der Installation aufrechtzuerhalten, arbeitet die maxx-solar energy ausschließlich mit Alumni der maxx-solar academy, den so genannten maxx-team Installern zusammen. In regelmäßigen Treffen werden Informationen über aktuelle Entwicklungen und Probleme ausgetauscht. In diesen Treffen geht es auch immer wieder um das Thema Finanzierung. Nicht jeder Südafrikaner hat die finanziellen Mittel, in eine eigene PV Anlage zu investieren, aber viele wünschen sich, unabhängiger vom Stromversorger zu sein. Viele leiden unter den immer wieder auftretenden Stromausfällen und den steigenden Strompreisen. „In einem maxx-Alumni Treffen Anfang 2015 entstand die Idee, den deutschen PV Mieten Ansatz nach Südafrika zu transferieren“, sagt Antje Klauß-Vorreiter, Leiterin der maxx-solar academy. „Mit der dena haben wir auch einen Partner gefunden, der es uns ermöglichte, das Konzept in zwei Pilotprojekten zu testen“, so die 42-Jährige weiter. Am 19. Mai war es dann so weit, die ersten zwei maxx PV Renting Photovoltaik Anlagen wurden in Kapstadt eingeweiht. Das richtungsweisende Konzept von maxx-solar macht erneuerbare Energien für viele südafrikanische Kunden erschwinglich: Das Unternehmen verkauft die Anlage an eine Finanzierungsfirma. Der Endkunde, im Pilotprojekt die Dominican Grimley School und das Atlantic Gold Guest House, bezahlt an diese eine vorher definierte Miete und kauft damit den von der Anlage erzeugten Strom. Nach fünf bis zehn Jahren kann der Endkunde die Anlage für den Restwert erwerben. D.h. der Kunde kann den günstigen Solarstrom nutzen, ohne nur einen Rand zu investieren. Die beiden PV Aufdach-Anlagen an der Dominican Grimley School in Hout Bay (20 kWp) und am Atlantic Gold Guesthouse in Camps Bay (14 kWp) wurden als Vorzeigeprojekte im Zuge des von der Deutschen Energie-Agentur (dena) ins Leben gerufenen und vom Bundesministerium für Wirtschaft und Energie (BMWi) im Rahmen der „Exportinitiative Energie“ geförderten dena-Renewable-Energy-Solutions-Programms realisiert. Gebaut wurden die Anlagen von den maxx-team Installern Solarpower PB und RED Engineering. An den Eröffnungsfeierlichkeiten nahmen Klaus Heidorn, Ständiger Vertreter des Leiters des Deutschen Generalkonsulats Kapstadt, und Councillor Matthew Kempthorne, Chairperson des Energy and Climate Change Committee sowie zahlreiche Vertreter der südafrikanischen Wirtschaft teil. „Eine große Herausforderung im Bereich Photovoltaik ist die Finanzierung“, so Kempthorne. „Dieses Projekt zeigt uns heute den Weg in die Zukunft. Denn mit Partnerschaften zwischen Regierung und Privatwirtschaft können wir den Wandel erreichen, der global notwendig ist.” Die aus Deutschland stammende Besitzerin des Atlantic Gold Guesthouse, Alice Zidek, sagte in ihrer sehr emotionalen Rede „Wenn man durch Deutschland fährt, fallen einem die vielen Solaranlagen auf den Dächern auf…Wieviel sinnvoller wären solche Anlagen - und wirklich viele davon - in einem Land, in dem praktisch die Sonne den ganzen Tag lang sehr intensiv scheint“.